The most remarkable change in the February ranking is MongoDB climbing up to rank 5. However, we have covered MongoDB extensively in the past, and therefore we would like to draw attention to another very strong NoSQL system: Redis, the leading key-value store. We have received comments in the past that key-value stores aren't really database management systems, and therefore they shouldn't be in our ranking. For us, a DBMS is a system that stores and allows to retrieve data in a structured form. A key-value pair is probably the most simple structure, but it satisfies that condition. It's precisely that simple structure that makes key-value stores a very useful tool in many real-world applications, especially when performance is important. Most key-value stores, of course, provide much more functionallity than just storing key-value pairs. Redis supports structured values, lists, sets, server-side scripting, automatic key expiry, publish/subscribe message queues, transactions (sort of), and in recent versions also replication. This is a quite unique feature set, not derived from any database theory, but guided by a deep understanding of what programmers might actually need. The growing popularity shows, that Salvatore Sanfilippo and the rest of the Redis team did a really awesome job in providing a powerful open source system, which is now an integral part of many developers tool set. 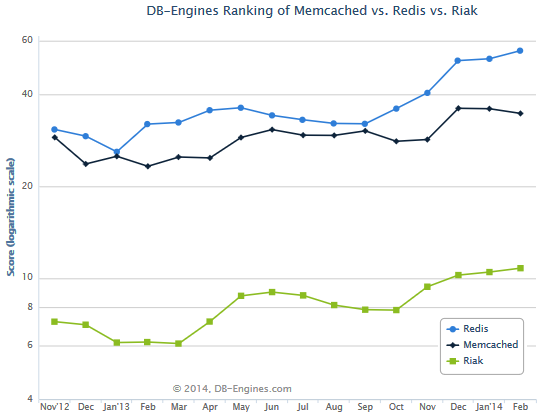 This chart of popularity scores also shows that not only Redis gained in popularity, but also its closest competitors Memcached and Riak. Memcached is best known as a caching solution for web sites, however, it evolved into a very generic system that can be used for much more. The fact that other DBMSs such as Couchbase and several other systems support the Memcached protocol shows its strong position within the DBMS community. Riak is one of the most feature-rich key-value stores, with particularily strong data distribution support, and thus special focus on availability and scalability. The fact that the three leading key-value stores as well as several other systems not mentioned here all gain in popularity, shows the growing significance of this DBMS category. Key-value stores often don't compete with other categories such as RDBMSs, but provide specific features and properties not to be found elsewhere. It would be no big surprise if one of them soon breaks into the top 10 in our overall ranking.